Review: "Alexander Kostarev Group: Live@InProg" - Sea of Tranquility - The Web Destination for Progressive Music! One of the appealing benefits of reviewing music is the immediate awareness one gains of material that would have otherwise remained totally unknown were it not for the preparedness of aspiring bands and small, independent labels to offer copies of their music to organizations such as Sea Of Tranquility. 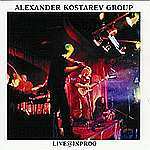 Such is the enjoyment to be found when listening to the Alexander Kostarev Group whose live performance in Moscow at Inprog 2003 has been captured and recorded onto CDR. Although promotional material is non-existant, a check of the website given also failed to load so I am unable to add any other pertinent information. Featuring 7 well developed and fairly lengthy songs, the lads have concocted an assortment of music that fuses inspiration from the Middle East, with its rhythmic drumming propelling the sound forward, some slightly reminiscent David Ragsdale style violin and a bevy of fuzzed out guitar underpinned by some solid percussion and bass. With an exotic, jazzy / fusiony vibe permeating throughout most of the songs, the treatment given to the guitar really keeps this bands music tight and relevant. For the most part, there is no sloppiness and meaningless drivel going on here at all, although by the last few track, I detected a little ambivalence in the intensity of the songs and thought perhaps their ideas had run a little dry. For a live performance, however, the sound is amazingly tight with some brilliant sounds courtesy of the flute trading notes with the guitar and violin and being held together with some exceptionally crisp drumming. The dynamic arrangements on the 4th track, "Limbo" and the following piece, "Hacker", although a little more frenetic and maniacal, typify what can be done musically with well conceived ideas being performed by exceptionally gifted musicians. The temperature drops dramatically with the sixth track, "Oasis" being a much softer piece while "Concerto Grosso #1 creates a different vibe altogether with some great organ, guitar, flute and is backed up once again by that omnipotent rhythm section. Although my promotional material lists 7 songs on the cover, there are in fact 10 songs totalling over 54 minutes of well played music that should appeal to those with a penchant for the likes of Brand X. One word: Challenging. And intellectual and demanding. Okay, that's 3 words. And avant garde. Energetic. That's ... can't count that high? Well you get the picture. Imagine King Crimson crossed with Univers Zero by way of the Energizer Bunny. The standard of musicianship on this record is very impressive, particularly considering that it was played live. The style runs from fusion to progressive symphonic to neo-classical and all the way back to jazz. Kostarev's guitar is mostly fuzzy and fast - providing more of a tone than a tune - and most pieces run at a frantic non-stop pace with crazy guitar solos, tons of violin, Hammond and breathless flute, and a relentless bass and rhythm section. The instrumental line-up includes tablas, flutes, harmonica, violin, keyboards and sax - and the array of sounds and the diversity of textures seem to be endless. Even the soft, quiet sections have an impatient vibe to them that leading you to imagine that Alexander Kostarev would have joined so many of us at the front of the Ritalin line at school. The fusion is given a rest in the second half of the record during the 24-minute "Concerto Grosso #1", an epic in 5 parts that has far more in common with modern classical music than with any form of rock or jazz. Kostarev must have been classically trained (the web site is purely Russian, so who knows) and besides the musicianship, the strength and the subtleties apparent in the compositions yield a body of progressive music that will appeal to the purist but may alienate the novice. If these guys had appeared in England in the '70s they might have stolen King Crimson's thunder. As it is, they're Russian and are trying to break into the western market - and with this quality of musicianship they deserve every success they can muster. This is the kind of band that could headline NEARfest, if they were better known. Yep - it's that kind of music.